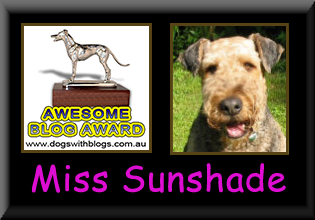 Life of Miss Sunshade - The Vancouver SuperDALE: Anything for mum.... ya know?? Well, why wasn't D-Guy wearing this on his head HUH?? 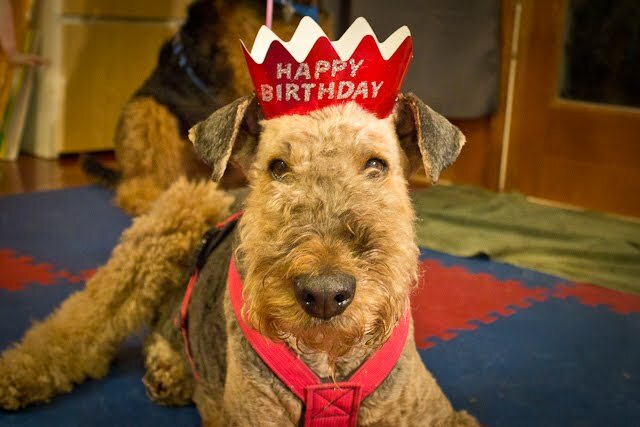 Happy Birfday mum.... you know there's nothing I wouldn't do for you... now, will you take this thing OFF my boootiful head please? Not yet of course... she wanted MOOORE pictures. We each had a balloon attached to our harness. While a shark for STINKY totally made sense (since he's the landshark), I had no idea why mine was a P-I-G???? 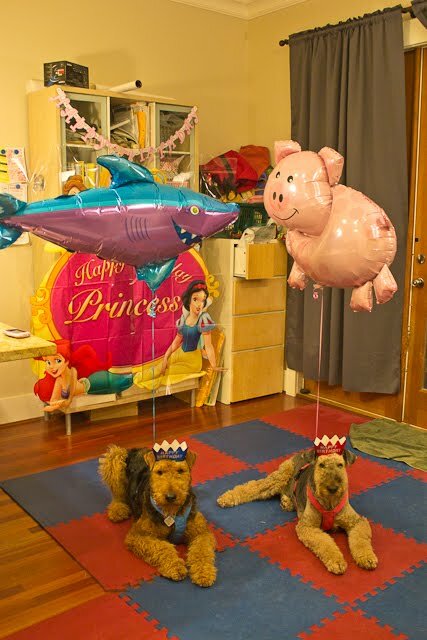 Okay... thanks for taking the hats off... how 'bout them balloons now?? (mum: This is what I came home to today after work! 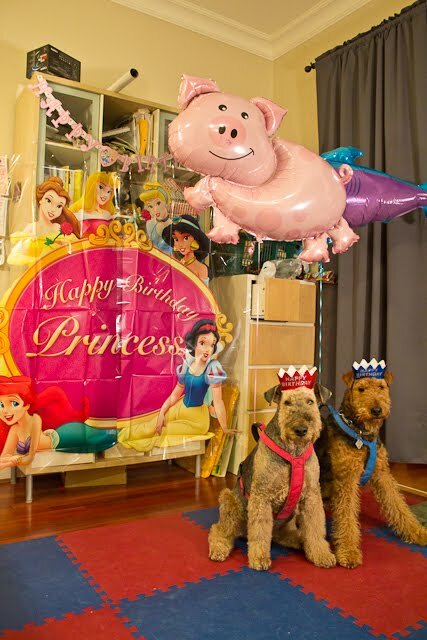 "Airedale" decorations!! Sunshade and Jaffa each had a balloon tied to their harness, and wearing the birthday hats!! I guess the theme for my birthday was Disney Princesses LOL! They actually sat and stayed when I walked in. I was instructed to text before going inside. THANK YOU all for the lovely birthday wishes, you are the BEST!! Amazing! D-guy outside himself...as did sunshade and haggard! Joan, jack, and the woofers! Now we see that the balloons are tied to you! We're suprised that you're not floating through the Aire, Sunshade! You have been looking very well lately, Sunshade, and we're so happy to see it! 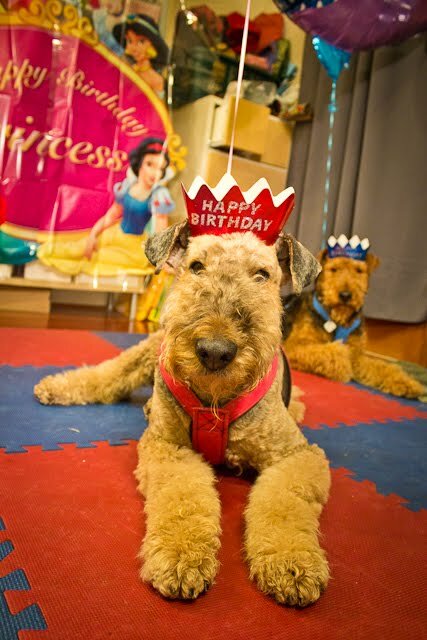 We hope every birthday is as happy for your mum as this one is! So cute! 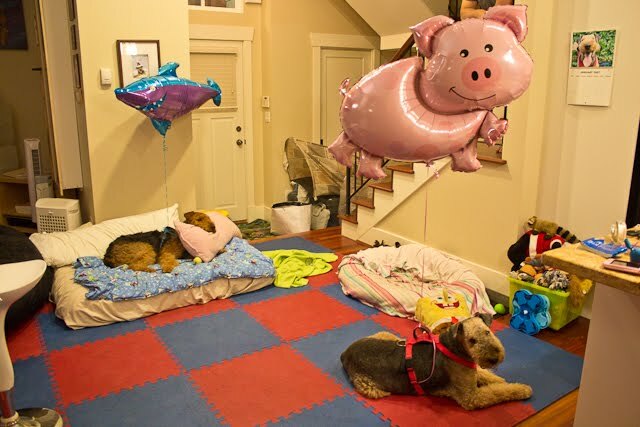 Love the balloons themed for each pup! 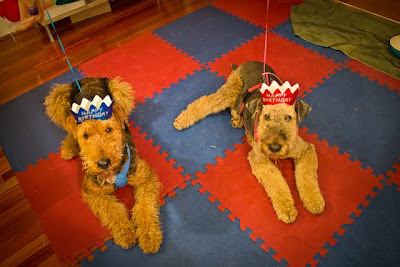 Sunshade you & Jaffa are GrEaT birthday greeters! Happy B-Day to your sweet mama. Hi Miss Sunshade, yeah I was wondering about the ongoing "pg" theme. Remember Hallowe'en? I think it's time for you to have a little chat with your evil mum and the dastardly D-guy.